Product #21375 | SKU 1856 | 0.0 (no ratings yet) Thanks for your rating! 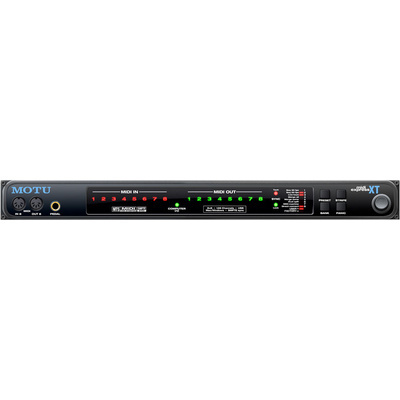 The MIDI Express XT USB is based on the industry standard MIDI Time Piece. The unit provides 8 MIDI in, 8 MIDI out, 128 MIDI channels and is "plug-and-play" compatible with all Macintosh and Windows software. Software consoles for both Mac and Windows platforms provide comprehensive routing, merging, and muting with 16 convenient, one-touch front-panel presets (8 factory and 8 user programmable). Full Time Code and MIDI Machine Control implementation make this interface a fully professional product.